A recent photo of Hanley with John Kane, whose research has led to a new appreciation of Hanley’s pioneering role. Simply put, Bill Hanley wanted things to sound better. How much better? John Kane, a scholar who has made Hanley the focus of his doctoral thesis, argues that Hanley was an East Coast pioneer in sound engineering whose success at amplifying and reinforcing music on stage for the ears of ever-growing audiences helped to facilitate the golden age of music festivals in the 1960s and 1970s. Hanley — dubbed “the Father of Festival Sound” — and younger brother Terry, who together ran Hanley Sound, Inc., will be honored in their hometown of Medford Saturday with a ceremony and placement of a historical marker at the 430 Salem St. site that formerly housed their business. It is now a Dunkin’ Donuts. The event will take place as part of the Haines Square Fall Festival, the third annual community event that will also include a fund-raising road race (for Juvenile Diabetes Education), vendors, food, and music. Fittingly, the headlining musical guest will be 1960s-70s icon Melanie Safka (a.k.a. Melanie) whose hits include “Brand New Key,” “Lay Down (Candles in the Rain),” and “What Have They Done to my Song, Ma” – all of which should resonate with music historians and grown-up hippies. Mayor Mike McGlynn called the placement of the marker “a long overdue honor” for the Hanleys. The ceremony at which the marker will be placed is scheduled for noon. 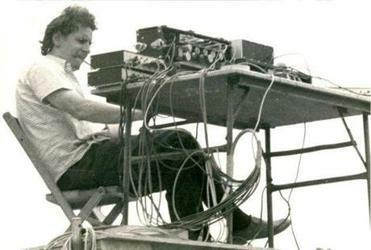 Until it was unearthed by Kane, a Franklin Pierce University doctoral student, Hanley’s history was known primarily to the people who hired him to provide sound for large-scale events all over the East Coast beginning in the 1960s. Since then, Hanley has become the focus of Kane’s thesis, which is being written and made into a documentary film featuring interviews and footage of some legendary pop icons from the 1960s and 1970s such as Melanie, Stephen Stills, Johnny Winter, and Mark Farner, lead guitarist and singer for Grand Funk Railroad. By Kane’s count, Hanley worked at three-quarters of the pop and rock festivals of the mid-1960s to the early 1970s, including the Newport Folk/Jazz festivals (including Bob Dylan’s electric concert) and the Woodstock Music Festival of 1969. 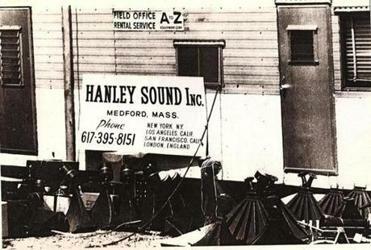 Hanley’s sound trailer at the Woodstock festival. Hanley’s goal was to give the folks in the last seat in the house the same musical experience as those in the front row. One of his innovations was to move the sound board (which coordinates amplification of individual microphones and speakers) into a central location facing the stage from the audience. It had previously been in back of the stage or in a separate room, as promoters didn’t want to give up space they could sell for seating. “When rock and roll came, with the Beatles and the noise level of what was happening on the stage, the necessity for having big and good equipment and understanding what was happening got very important to them,” Hanley said. He started out providing sound for speeches and at sock hops, and his first big concert was in the ballroom at Boston’s Bradford Hotel for the pianist George Shearing. He was soon working on the sound systems at Boston’s rock venues, Fenway Park, and at the Newport Jazz Festival, beginning in 1957. From there, his business grew, and he was providing sound for concerts at colleges, high schools, and larger venues, including outdoor music festivals, the Johnson inauguration, the Nixon-Agnew whistle-stop tour of 1968, and other events. 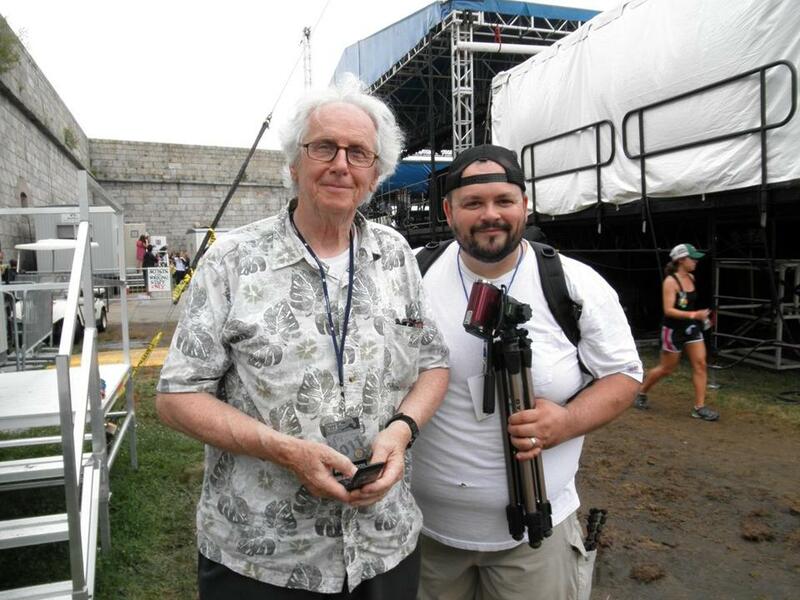 Medford native Bill Hanley at the mixer that fed sound to an estimated 500,000 at the Woodstock festival in 1969. “I was the guy running around the country, to anywhere I heard of a big event happening, to try to make it happen better,” said Hanley, who reinforced the sound by integrating sound systems. He and Terry – nine years younger and second-in-command at Hanley Sound before striking out on his own in the early 1970s — would also put people to work, lugging truckloads of speakers and other equipment to large-scale events. The younger Hanley, who toured during the 1970s with Aerosmith, still runs Terry Hanley Audio Systems, Inc. a full production services company in Woburn. Kane has found local businesses to sponsor the plaque and group-funded the documentary video, in addition to dipping into his own savings. He has interviewed Pete Seeger, members of Wavy Gravy, the Cowsills, and Barry and the Remains, as well as Melanie, Farner, and other musical figures active in the late 1950s, ’60s and ’70s. The city is paying for the musical acts, including Melanie. E-mail David Rattigan at DRattigan.Globe@gmail.com.